As part of the Insight Data Science Program, I worked with OneSignal to tackle one of their data problems. OneSignal was kind enough to invite me to do a guest post here to quickly talk about the results of my work. If you're interested in more specific details (e.g. modeling process and validation), I talk more in depth about this project on my blog. If you own a mobile app, you know that push notifications are an important way to engage your users. My task was to find out when to send notifications to maximize the number of conversions. Some things to keep in mind is that these peaks don’t correct for the pure number of notifications sent. For example, if the most notifications were sent at 8pm to gaming apps, you’d naturally expect more conversions during that following hour. 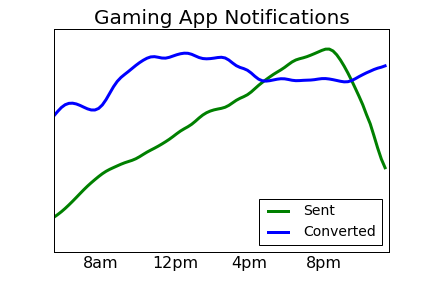 Another caveat is the graph shows when conversions happened, regardless of when the notification was sent. OneSignal doesn’t keep track of the results of all the notifications sent in general, so I wasn’t able to correct for these. Re-engagement notifications are only a subset of the notifications I looked at in the previous section. They’re especially important to track though as they’re targeted at users going inactive in order to reduce churn and extend the lifetime value of each user. The main question was how does the timing of the notification influence conversion chances. Below, you can see the results of my model for gaming apps. 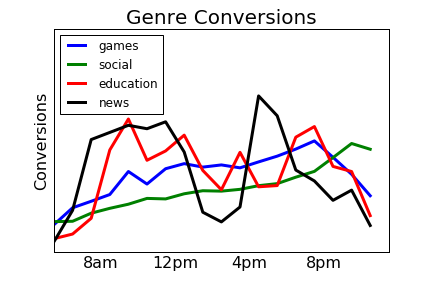 Unsurprisingly, genre has a huge impact on conversion chances throughout the day. I left you with some suggested timing patterns for notifications overall and then specifically for re-engagement notifications. I trust the re-engagement results more since those results don't come with any of the caveats I mentioned in the first section. In general, these are the results I've found and I'd encourage any app to take advantage of them to make their decisions more data driven. If you do, make sure to come back and tell us the end result!